Linda Scottsdale casa com piscina privada e Spa! Esta linda 3 Quarto, 2 casa de banho privada está localizada no Norte de Scottsdale na área Kierland altamente desejado. Localizado a poucos quarteirões da exclusiva Westin Kierland Resort and Spa, de classe mundial Kierland Golf Course e compras de luxo e jantar no Kierland Commons e novo Scottsdale Quarter, apresenta um design muito bonito quintal / pátio com uma belíssima piscina privada / spa. A casa está muito bem decorado e tem todas as conveniências de um destino de férias perfeito. Perto de um grande jantar, compras, golfe, caminhadas e trilhas de mountain bike. Privado Quintal Pátio com piscina e spa. Com uma localização central em North Scottsdale. Vinte e cinco minutos do aeroporto de Phoenix. A duas horas de carro de Sedona, Tucson, ou quatro horas para o Grand Canyon. Esta casa está totalmente mobiliado com uma cama king size na master e duas camas queen size em cada quarto adicional. Existem televisores de tela plana no quarto principal e na sala de estar (sala de estar tem um 42 'tela plana 1080p), televisores adicionais em cada quarto, TV a cabo, leitor de DVD / VCR, sistema de som com CD player, alto-falantes dentro e no quintal, lareira a gás na oom livingr, piscina seixo-tec privada aquecida e jacuzzi, churrasqueira a gás (churrasco), telefone local, ar condicionado, cozinha totalmente equipada com microondas, fogão a gás, máquina de lavar louça, geladeira, utensílios de cozinha, louça, copos , talheres, liquidificador, máquina de café e muito mais. Lençóis, toalhas, toalhas de praia, secadores de cabelo, ferro e tábua de engomar fornecidos. Lavadora, secadora, e garagem para dois carros. Absolutamente não é permitido fumar. Major League Baseball Spring Training. Caminhadas e trilhas de bicicleta. Desert Jeep Tours e balões de ar quente. Atrações temáticas ocidentais no Rawhide e Greasewood Flats. Phoenix Suns, Phoenix Coyotes, Arizona Diamond Backs e cardeais. De teatro e musicais e concertos. Relaxar Pool Side --- Sem vizinhos por trás! This is a beautiful well maintained property. This property is beautifully maintained. It is well equipped and has a beautiful pool area. The house has 3 bedrooms and very comfortable kitchen and living room. Location could not be better--very quiet street with adjacent large park containing lots of room for a pet as well as tennis courts. Very near restaurants and grocery shopping Beautiful Kierland Mall is a stones throw away. What a fantastic place! We stayed 5/25-6/4 and the weather was great. The house was clean, nicely decorated and has new furniture in the living room. The engineered floors are new too. 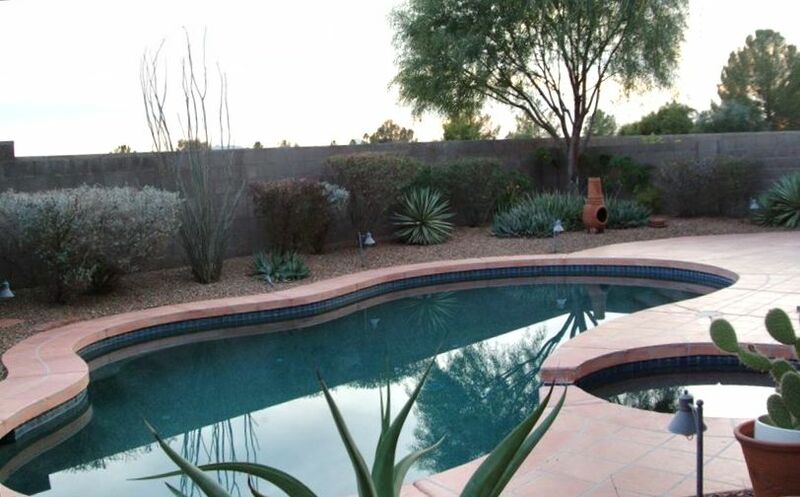 It’s in an great neighborhood, just a few minutes from everything in Scottsdale. Shops, restaurants, you name it. The location can’t be beat. The owner is great, very easy to communicate with. We loved sitting in the backyard after a day of golf, and using the pool and Jacuzzi. We even barbequed a few nights. Love this place so much, we’re coming back in the fall. This house was perfect for our vacation. It was clean, very comfortable and had everything we needed for a 2 week stay. We loved that we could have the pool heated and spent most of our time outside. Grocery shopping, wonderful restaurants, walking trails and Kierland shops were just minutes away. We also appreciated the fact that JoAnne allows pets, so we were able to bring our 2 Bichons with us, and they enjoyed relaxing outside as much as we did! JoAnne is a wonderful host; she answered all of our questions promptly before we arrived, and was always available by phone or email. We can't wait to come back! Thank you JoAnne for sharing your lovely home with us. We stayed here for a getaway golf trip in early December. It was super comfortable, spotlessly clean, roomy, and very well appointed. The location was perfect, close to the Commons for restaurants and close to many golf courses, including the TPC. This place was simply amazing and we will definitely stay here again! Thank you so much. We just returned from spending one wonderful week at this Kierland home. Upon arrival everything was as described and pictured on this site. The house is extremely clean, well stocked, comfortable, and welcoming. The Kierland location is ideal for long strolls in the neighborhoods, and easy walks to grocery shopping, Kierland and Scottsdale Quarters for fabulous shopping, dining, and fun! JoAnne is a dream to work with and made sure everything was just perfect! I highly recommend this house for your next Arizona vacation! We stayed in this lovely, comfortable home in March 2014. The location is awesome, with all of the dining and shopping you could want within walking distance. Our little dog loved our daily walks around the golf course and laying by the pool in the back yard. The house is spacious and comfortable with plenty of linens and amenities and would be great for families. The back yard is awesome and where we basically lived for our month long stay. The heated pool was wonderful and we used the hot tub every day and evening. It's completely private and the grill and dining area were perfect. I would highly recommend this property for families, couples sharing a vacation, golfers and people with a small pet. First $150 of combined gas/electricity included on monthly stays. Pool/spa heat based on actual use. Pool heat deposit refunded if full amount not used.